Do you enjoy a lively festival? Want to combine a festival with this year’s narrowboat holiday? Time is running out to book a narrowboat holiday that coincides with St Georges Fayre, our local festival that welcomes thousands of people into March each year. You can expect to enjoy live music and dragons, great food, Morris dancing, a craft market and an art exhibition. This year our town fayre, celebrating England’s patron saint, is on Sunday 22nd April 2018. The town centre will be pedestrianised, creating space for a bustling street market, a fun fair, and dance performances throughout the day. The day begins with a parade, in celebration of St George, moving from The Fountain, Broad Street to the Market Place, where the Mayor will do the official opening at 10.30am. The judging of the Fancy Dress Competition follows at 10.35am. The free entertainment on offer during the day includes Punch and Judy shows, circus skill workshops, and falconry. 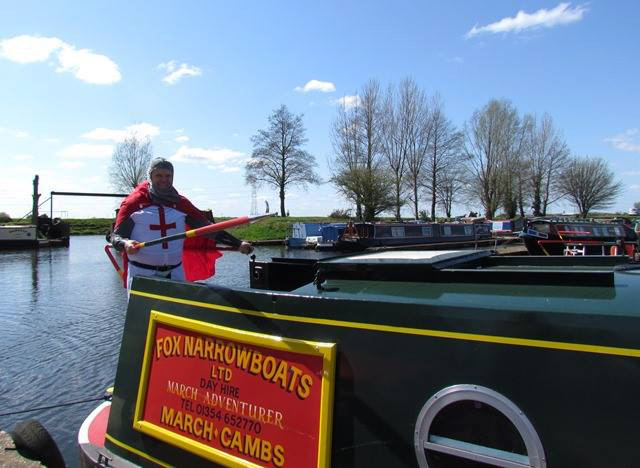 Fox Narrowboats will be running 30 minute boat trips throughout the day and this year we are raising money for March Heart of the Fens Defibrillators for March. 12 boat trips run throughout the day along the Old Nene between the town bridge and West End park. The trips last 30 minutes and give people a chance to experience a journey by water. St George’s Fayre is one of four ‘Four Seasons’ events which take place in Fenland’s market towns throughout the year. The Fayre is organised by Fenland District Council and a committee of volunteers; it is also supported by March Town Council. Town community organisations that have contributed to the event’s success over the years include; Fen Craft Fairs, The Chamber of Commerce, March Library, March Museum, March Society, Churches Together, The Rotary Club, March Lions, Georges, Markets and Events Ltd and many more. Check out the live music and dragons in this two minute video at the St Georges Fayre Facebook page. Remember there will be over 100 stalls, a craft fayre, fun fair, street food and much more. We have some special offers on at the moment that mean you could combine your last minute holiday booking with this festival. For example you could book narrowboat Leisurely Fox, (which sleeps 4-6) for seven nights starting from Monday 16th April. The price was previously £1575, but is now on offer at £1350 – and you can finish your week off by attending the festival. Search for more special offers here; prices start at just £699. But hurry, the fayre is on 22nd April! Don’t miss more articles about what to see and do when narrowboating in the Fens: Sign up to follow this blog on the right of this webpage.